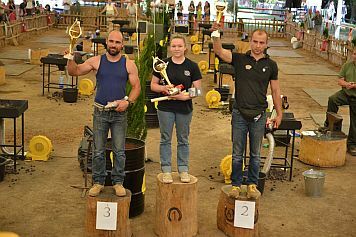 This year saw an even greater number of foreign farrier competitors representing 6 countries (HU, UK, FR, FINN, PL, Ger). The 21 competitors in all included two from Finland for the first time, 4 from the UK, and three women. William Hampson (UK) came last year as participant, and who has a Hungarian wife from Debrecen, returned as a judge this year. 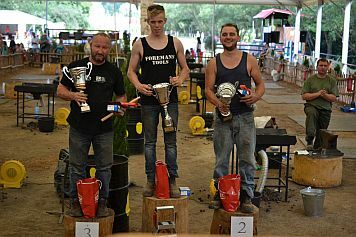 He was joined by compatriot Nigel Fennell, who at 27 has already won the UK National Farrier Championship, won silver in the world championships, and was a finalist in the European championships. As usual, events included forging 2 surprise shoes, shoeing, eagle eye, and the team wine opening competition. The first half of the day was brutally hot, especially in the farrier's tent. Later, the skies opened up in the afternoon and we got hit with a big storm that even took the power out for half an hour. I was worried that my pickles fermenting at home outside would be drowned, but 27km away it did not rain at all. Our guests from Hortobágy National Park were not deterred from performing their half-time show and demonstrated, among other things, the famous trick writer Zsigmond Móricz invented in one of his short stories which involves a rider standing astride 5 galloping horses. Horseback archers also showed their skills in the rain as spectators huddled at the edges of the tent. While the farriers could continue to compete under cover, the afternoon hucul events were unfortunately rained out. I always look forward to the team wine opening competition. The organisers are always able to add a new twist to this event that is only held in Hungary. 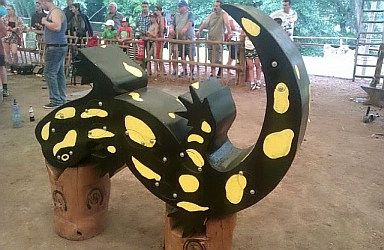 This year, a giant wooden fire salamander (Aggtelek National Park's logo) was constructed. Ten of the salamander's distinctive yellow spots were actually doors closed with 2 large bolts, behind which were hidden 5 bottles of beer and 5 bottles of Tokaj Furmint wine. The ten teams first had to fashion a tool to loosen the bolts on a spot. If they got the door open and it contained a beer, the event was over for them. If a team got a door open and there was wine, the team then had to forge a tool to open the wine without breaking bottle or pushing cork in. After getting a door open, most teams put their tool back in the forge and hammered out a new tool. However, the French just struck off one half of their spanner and proceeded to make a corkscrew from the remaining tine. Unfortunately, this did not help them. In the end, the British judges won the event this year. The German team were still working valiantly to make an appropriate tool 20 minutes after everyone else had pushed their corks in and were disqualified. Sadly, Tom and Jenny also eventually accidently pushed their cork in. The last event of the day was Everyday Heroes. 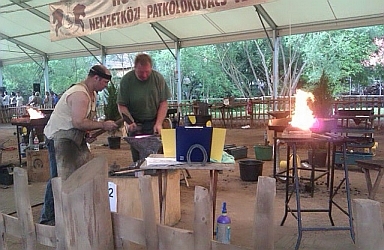 Spectators could register to compete, together with one of the farriers to make a horseshoe in 45 minutes. If I had known, I would have also tried, but there was no information anywhere about what this involved, so I could not register. Next year. Four of the 9 contestants were women, including the eventual 1st and 3rd place winners. I noticed Harry Meeks (UK) in particular was a patient and good teacher with his young charge who placed last, but with a big, proud smile on her face. I also stopped into the Green Island Playhouse where Krisztina Visnyovszky took me through the different environmental interactive activities. Judit Dudás Galiczáné, manager of the MagtArt Arts Granary and I constructed storks nests and tried to balance a minimum of 3 eggs in them. 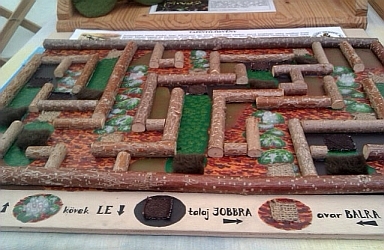 I was blindfolded and ran my finger through a maze, turning left, right, up or down depending on the terrain encountered (moss, rocks, leaves...). 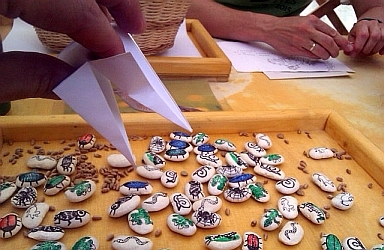 Lastly, I competed with a young girl picking up different insects (painted on beans of different sizes) with origami bird beaks. I had a great time, and was sorry Lili was not here this year to try the activities. I was looking around the garden when I got home and heard that the water pump was going non-stop. I raced down to the basement and discovered water everywhere and bottles knocked off shelves. The brand new rubber balloon in the water tank had exploded for some reason, and the water exited at high pressure directly into our shelves of pickles and jams. Luckily nothing was broken, but we were again without water. So, I missed Sunday cleaning up the mess, organising repairs and hauling water in bottles from the communal pump by the cemetery. Our neighbour Zoli came to the rescue again and was able to temporarily repair our old balloon. We have no idea why the valve sheared off or why the pump did not turn off. Ludovic MATHIEU (F), twice silver medallist at the European Championships, 3rd at the World Championships, and 15-time national French champion. Ludovic was last year's overall winner in Jósvafő. On the way down to the event I walked past the bus stop near the directorate and picked a couple mushrooms I was able to show to Gabor Koltay who has his mushroom inspector certificate. Gabor and his wife Krisztina set up their annual stand selling their delicious organic homemade, and Aggtelek National Park certified jams and dried mushroom products. In the novice category farriers had 75 minutes to forge 1 front and 1 hind shoe.